A Scot came to America with his sons over 300 years ago, one of which was involved in Scotch production. Taking what was in abundance to the northeast, apples, and distilling it came naturally. The family business has survived wars (one was a soldier in George Washington's army), fire and worst of all, the Prohibition. Enjoy this in a myriad of cocktails such as the Jersey City Cocktail. Shake in iced cocktail shaker & strain 2 oz applejack 1/2 oz pineapple juice 1 dash Angostura bitters 1/2 tsp sugar Serve in a cocktail glass Or you can simply sip it straight up. Back in the day, people were fearful of the water and drank this instead. You know what they say, "An apple a day keeps the doctor away". If you haven't had an American apple brandy before, think of the Laird's 100 as the gruff, flannel-clad cousin of the Calvados you know and love. This apple brandy has a hot, spicy nose, full of baking spices and clove. The palate is warm, with a honey and red apple character, reminiscent of Rosh Hashanah with my college roommates, and the finish is rich with allspice and oaky vanilla. Laird's is fine to enjoy on its own, but for something a little crazy, I tried it in a variation on the Vieux Carre. Equal parts rye whiskey, red vermouth (I used Cocchi), and Laird's apple brandy, with two dashes each of the Bitter Truth aromatic and creole bitters and a half barspoon of Chartreuse. I stirred this concoction over ice for about a minute, and then served it up in a coupe. Cheers! 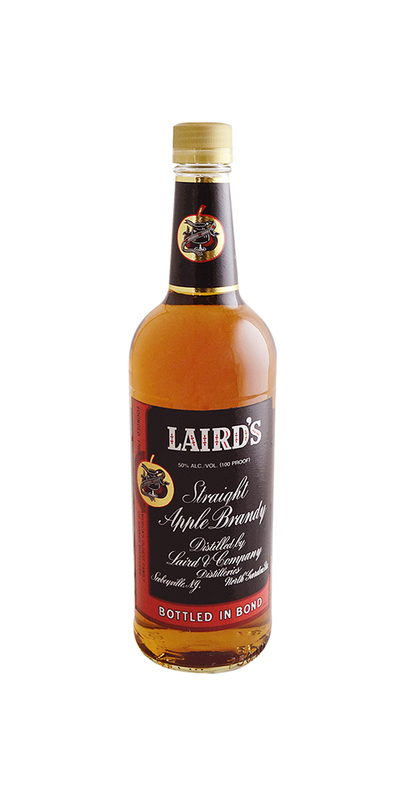 Notify me when Laird's Apple Brandy 100° is back in stock.